Ouch! Can My Dentist Stop My Annoying, Constant Jaw Popping? Were you an avid gum-chewer before your TMJ disorder? You know, the type of person that always kept a pack of sugar-free gum to smack on and help the time pass by? That was until you noticed your jaw popping each time you opened and closed your mouth. What happened to cause your dental discomfort that lead to your TMJ disorder? Learn more about how this condition can develop and even more importantly—how your dentist can help you treat it. You don’t appreciate functioning TMJs until it’s too late. The formal name for your TMJs are temporomandibular joints. These are the hinge joints that connect your lower jaw to your skull. 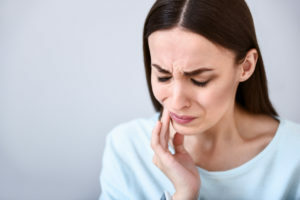 In the times that your TMJs begin to malfunction, you’ll start experiencing the painful side effects of TMJ disorder—including that annoying jaw popping symptom. You may have issues chewing and eating as well as speaking. These symptoms can include clicking, pain, or the jaw becoming stuck in an open or closed position. Pain, tenderness, aching, or fatigue in your jaw. Pain in the face, neck, or shoulders. Discomfort when chewing, speaking, or opening your mouth wide. The jaw becomes stuck in an open or closed-mouth position. Clicking, popping, grating noises that come from your jaw. Tiredness in your facial muscles. Painful changes in your bite. Swelling on either side of your face. Why does TMJ disorder develop? If you’re experiencing pain in your head, neck, or jaw, you may turn to your general health practitioner, but in reality you may need help from a dentist. Most patients wouldn’t assume that their dentist would be able to help. Instead, when you seek help from your dentist, you may be able to discover what caused your TMJ disorder. In most cases, the combination of stress and bruxism (teeth grinding) can be the cause of TMj disorder. Do you often struggle with teeth grinding or clenching? A lot of the destruction can be caused when patients are sleeping. That’s why dentists offer custom nightguards for patients experiencing TMJ disorder symptoms. This can put a barrier between teeth to reduce grinding and manage your symptoms. If you didn’t know what was causing your jaw pain, hopefully, this article helped you understand where it may be coming from. Get the help your smile deserves by visiting your dentist as soon as you notice signs of TMJ disorder. When it comes to dental pain, you need to visit professionals that can find you a solution fast and effectively. Many patients turn to New Image Dentistry for their high-quality dental care that exceeds expectations. If you would like to get help addressing dental pain, reach out to our helpful office team by calling our San Antonio office. Comments Off on Ouch! Can My Dentist Stop My Annoying, Constant Jaw Popping?